R. Wayne Skaggs was born and educated in Elliott County, Kentucky. He received a Bachelor of Science in agricultural engineering in 1964 (with high distinction), and a Master of Science degree in 1966 from the University of Kentucky. After receiving his doctor of philosophy in agricultural engineering from Purdue University in 1970, Dr. Skaggs joined the faculty of the Biological and Agricultural Engineering Department at North Carolina State University. 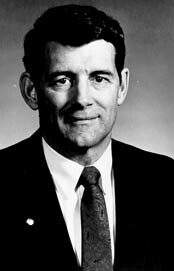 He was promoted to full professor in 1979, was named William Neal Reynolds Professor of Biological and Agricultural Engineering in 1984, and Distinguished University Professor in 1991. Dr. Skaggs has taught and conducted research in drainage and subsurface water management engineering for the past 24 years. He has served as major professor and directed the thesis work of 15 M.S. and 27 Ph.D. graduate students. Dr. Skaggs is recognized as the world’s leading authority in agricultural water management, serving as visiting professor and consultant throughout the United States and five foreign countries. His work includes the development of the water management model, DRAINMOD, which is widely used by consulting engineers, researchers and government agencies. The model was extended by Dr. Skaggs and his students to predict the movement and distribution of salts and other solutes in the soil profile and is being applied internationally to design and manage drainage and related water management systems. He is a registered professional engineer and holds memberships in numerous professional and honor societies including Tau Beta Pi, Alpha Epsilon, Sigma Xi, Gamma Sigma Delta, and Phi Kappa Phi. Dr. Skaggs has received numerous honors and awards including the Young Researcher Award and the Hancor Soil and Water Engineering Award from the American Society of Agricultural Engineers. He is a Fellow of ASAE and was elected to the National Academy of Engineering in 1991. This past year, Dr. Skaggs received the Alexander von Humboldt Foundation Award for his contributions to American agriculture. Dr. Skaggs was recognized for his cutting edge work in drainage, modeling, water table management, and wetland identification. Dr. Skaggs was inducted into the College of Engineering Hall of Distinction in 1994. He and his wife, the former Judy Ann Kuhn (B.S., Education, UK, 1968) reside in Raleigh, North Carolina. They have two children, Becky and Todd.